It's time for some finger-tapping fun! Compose a rhythm and programme this amazing robot hand to play it for you. Size 14cm. Teach kids the wonders of robotics and anatomy with the ultra cool robotic hand. Kids can make the robotic hand and tap out to any tune or beat. This educational science kit contains all the parts needed to create a functioning artificial hand. Pulling the attached cords cause the hand's thumb and fingers to clench in a realistic gripping motion. Fully illustracted instructions included. Also required but not included in the kit: a small cross head screwdriver, 2 x 1.5V AAA batteries. Age 8+ years. 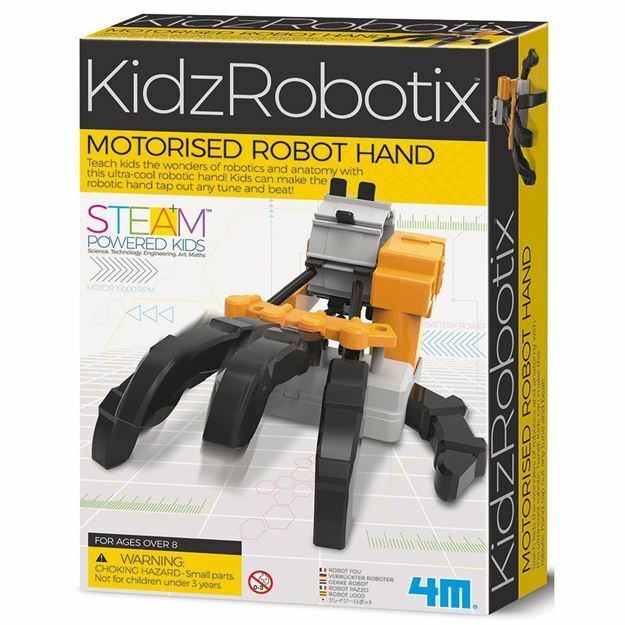 Part of the KidzRobotix range. Distributed in New Zealand by Holdson.